brand new roofing system, upgraded shingles, ridge ventilation and code flashings, all for the estimate provided by your insurance company. *Hundreds of Local References and 5 Star Reviews on Yelp, Google, FB and Kudzu! | Ask us about our Shingle Recycling Program! We offer residential and commercial insurance restoration services in the Metro-Atlanta, North Georgia area. There's no job too big or small for our qualified staff. At Palmer Contracting, Inc, we employ our own "in-house" roofing crews and don't sub-contract random and inexperienced labor to get the work done as fast and cheap as possible like most roofing companies in Georgia. 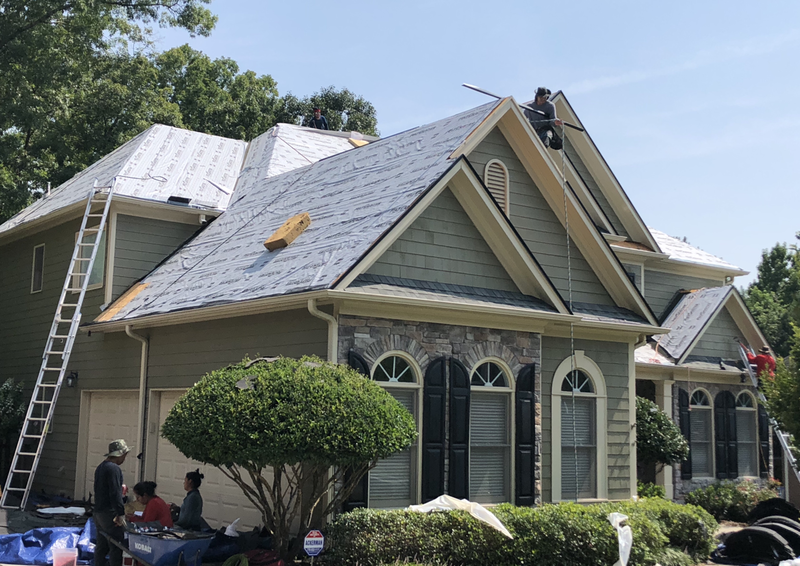 Our pro's are verified and vetted with up to date insurance and have been part of our family since we first began our small roofing company in Cartersville, Georgia in 2008. Unlike the other roofing and gutter installation companies we have a proven track record of providing consistent quality installation without all the pushy sales tactics and marketing campaigns. You can be confident referring us to your friends, family and neighbors because of the excellent service we provided you, and that’s our only “marketing strategy” ...a reputation you can trust, service you can rely on and a beautiful new roof you’d want to tell your friends and family about. Ask us about our referral program!